Grown by Peter Zale of Zale Botanica Za Les from seed collected throughout its range, this magnificent yellow form appeared. Peter remarked on his blog that "this seedling blew him away and he had to do a double take when it opened. 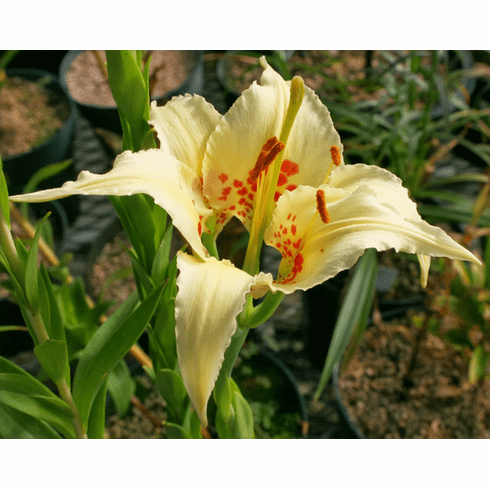 He reported that a photo of a similar plant had been posted on the website of the Pacific Bulb Society of a similarly colored plant that also originated in the Florida Panhandle. Peter's L. catesbaei differed in that it had much wider petals that were also spotted. A unique and rare color form of a difficult to grow US species. Success has been reported by an Alabama grower of both L. catesbaei as well as L. iridollae by growing them in a man made artificial bog. Photo copyright Peter Zale, all rights reserved. Used with permission. This page is for reference only, not as an offer to sell species bulbs or seeds. Sign up for our Newsletter to receive timely tips, web-only sales, plus all new catalog updates. We’re always responsible with your email! © 2019 - B&D Lilies�, All rights reserved.